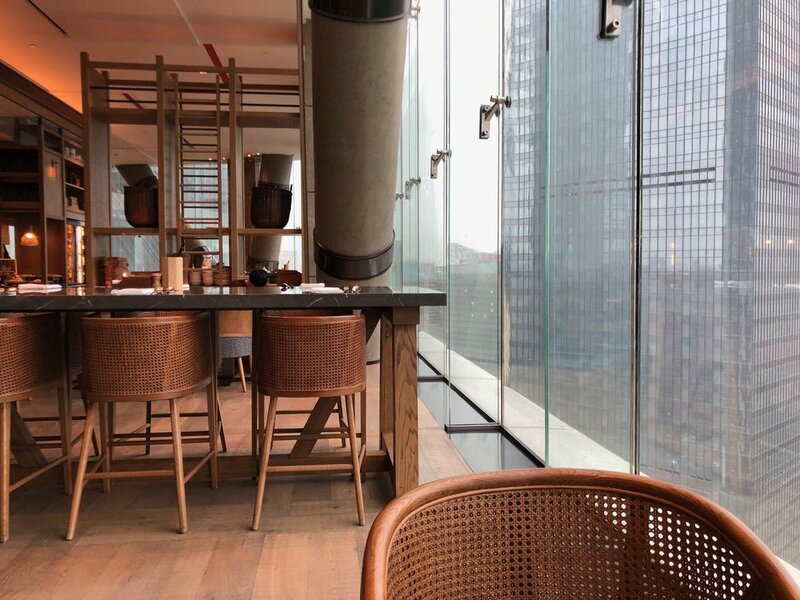 The Grand Hyatt Xi’an is located in the new “High Tech Zone” southwest of the historic center, and about 45 minutes away from the airport. It’s the right-hand tower of this double tower complex, connected by a skybridge. With the Tron-like choreographed lights changing in color, it’s the perfect setting for a dystopian film! The lobby is similarly futuristic and impressive, though with just a few sofas and chairs tucked to the side, it wasn’t the most welcoming place to meet or wait for someone, and definitely not a place to linger. My room on the 29th floor, one of the higher floors. A client booked this room, so to be honest, I’m not sure what category room this was. The hallway was decorated with artwork, and lined with a plush carpet - perfect for reducing the noise of passing service carts or luggage. The carpeting, together with the wood panelling and textured walls lent a warm feeling to this space. In this room, there’s a toilet with its own sink - handy if you’re sharing the room with others. Sometimes I’ve seen the toilet in a separate room within the bathroom, but that’s not as handy if one person needs to use the toilet and the other is showering (and wants privacy). Then after the powder room, there’s a little hallway off of the main hallway, with space for luggage and clothes, and also an ironing board and iron. There’s a separate closet further down the main hallway. …and then a separate shower stall with hand shower and overhead rain shower options. There’s a window onto the main bedroom, letting in natural light. But there was also a sturdy privacy divider that slid out to cover this window. Here you can see the bathroom from the bedroom side. In the bedroom, there was an L-shaped sofa - actually big enough to lounge on -, a circular table, and a separate, honest-to-goodness desk. Thank goodness they didn’t follow the trend to do away with a real desk in favor of the combination desk-dining table. Other nice touches abounded. For example, in the control panels next to the bed, you could mechanically draw the sheer curtains, and lower the blackout shade. 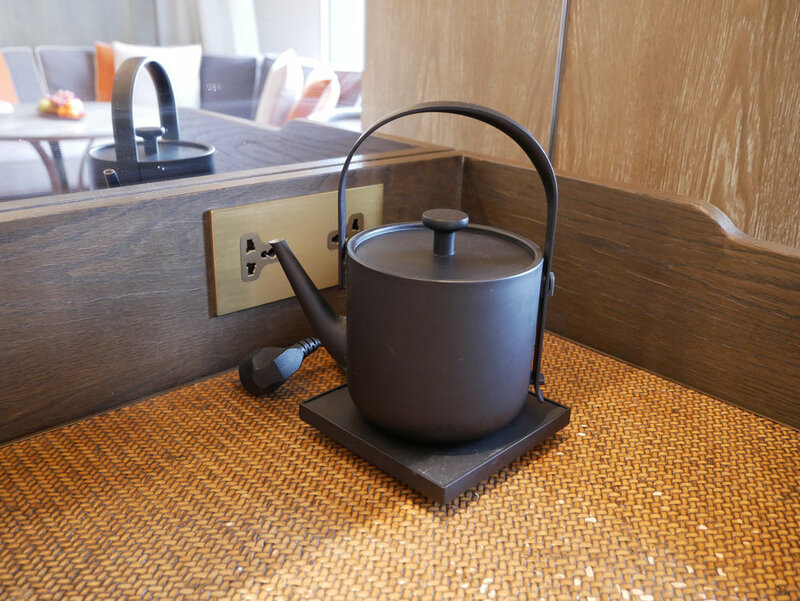 Even the in-room kettle was thoughtfully chosen to fit with the decor, which I would describe as modern Chinese. The view out the floor-to-ceiling windows was of the new skyscrapers of this new business district. When I arrived, there was a pretty fruit platter awaiting me. When I returned to the room in the evening, there was a really nice amenity: a box full of 水晶饼, shui jing bing, or crystal pastries, a typical sweet of Shaanxi province. Note that there is another sweet of the same name, I believe from Guangdong province, which is different: the Guangdong one is made with a glutinous rice exterior, making it translucent, while this one is made with a flaky pastry shell. 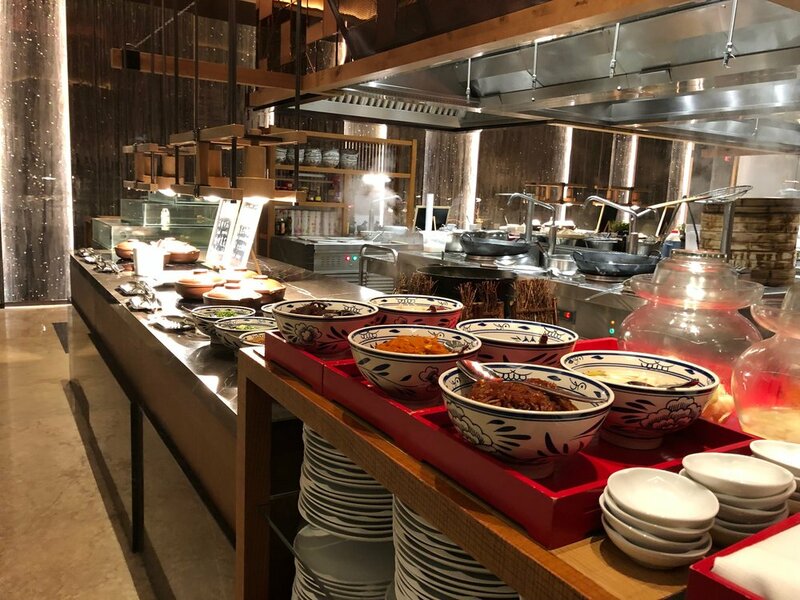 Since the box, labelled with the name of the Chinese restaurant within the Grand Hyatt, was quite a substantial size, I thought I would bring it back to Spain to share with my friends. Back in Spain, I finally tasted one. Delicious! 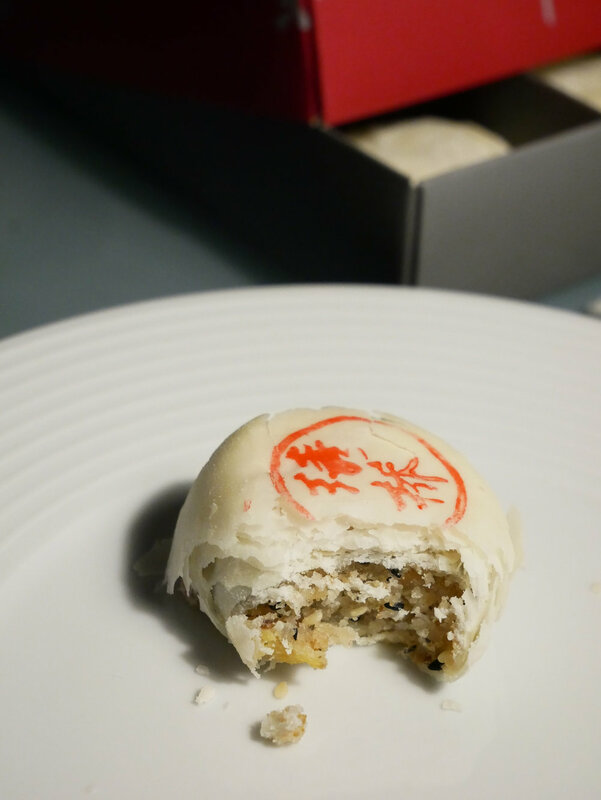 Inside was a crunchy, brittle filling, including black and white sesame seeds, walnuts, and what seems like candied orange peel. I read a recipe calling upon whole variety of nuts and seeds, along with osmanthus and rose, so it seems like quite a complicated little pastry. While I said I was going to share this box, I really gave only one to my roommate to try, and I’m quickly going through the other eight myself!! These are truly delectable treats. Breakfast was included in the rate, and was served in The Grand Café, in the skybridge between the towers. This was also a very pretty space - I think the designers did a good job of bringing Chinese elements into a modern design. The Grand Hyatt buffet breakfast belongs in that category of enormous, extensive, breakfast buffets found in the top hotels around Asia. There was even a station with Korean Fried Chicken! I liked that it had not only had Western and Chinese options, like this scallion pancake, cauliflower, and sautéed cabbage, it also had interesting local delicacies that varied by day. The first day, I had 甑糕 zeng gao, a steamed snack of layer upon layer of glutinous rice, red beans, and red dates. That’s what is in the little bowl. There was also a steamer full of various root vegetables which I found curious, like sweet potato, potato, and a narrow tubular root that I couldn’t identify. From the refrigerator of fruit, I selected pineapple, watermelon, pomelo, and dragonfruit, and from the adjacent bakery section, I too a 肉松 pork floss roll. As beverages, I really went to town. The green juice is a celery and cucumber juice. Unlike celery-cucumber juices in the west, this wasn’t sweetened by apple juice. It was almost savory. I also had a watermelon juice (also barely sweet), hot soy milk, and tea. 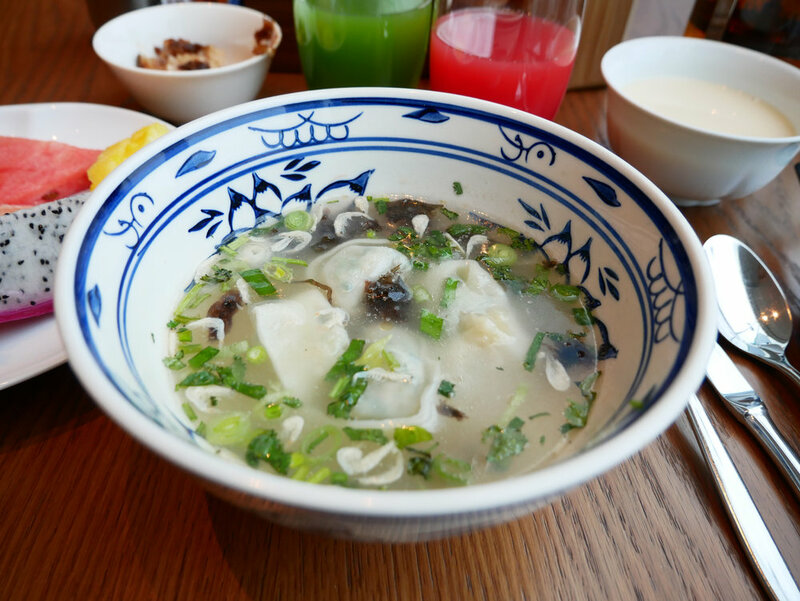 I also got a bowl of made-to-order wontons in chicken soup! The next day, in the station where there was the 甑糕 zeng gao previously, there was a new local specialty, 油茶麻花 you cha ma hua, a soup of sesame and peanuts, topped with a fried twisty thing. I was expecting this to be sweet, but it was also unsweetened, and almost savory - an ambiguity which I found quite often in China. The second day, I also had a bowl of fish congee with rather spicy pickled vegetables and peanuts. And I did try the “Korean Fried Chicken!” They were rather dry, and needed the squeeze of lemon. I also had fruit, and a matcha bun topped with black sesame seeds and filled with red bean paste. And a repeat from the day before, a fried pastry filled with sugar and sesame seeds. Chewy, warm, and nutty, my mouth is watering as I look at this picture again. I ended with a small bowl of millet congee, and a glass of watermelon juice (a bit sweeter the second day). 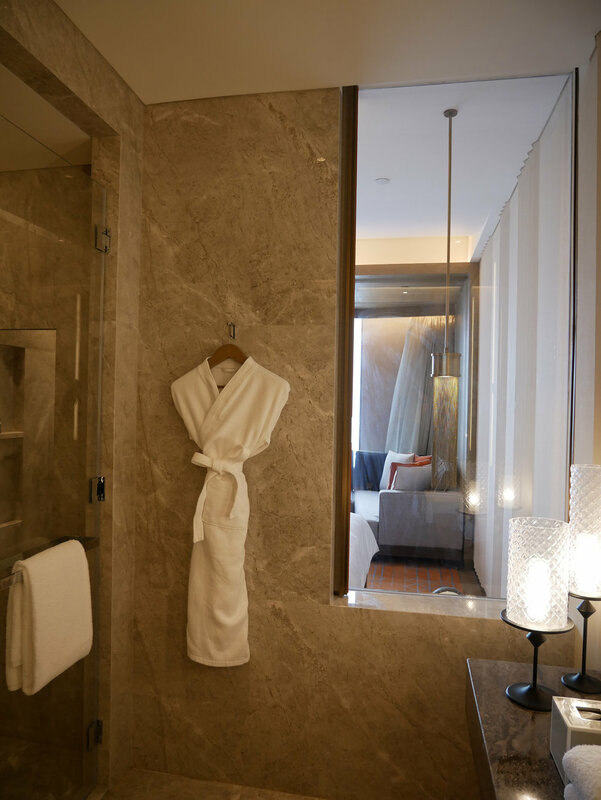 In summary, Grand Hyatt was truly one of the most comfortable stays I’ve had. 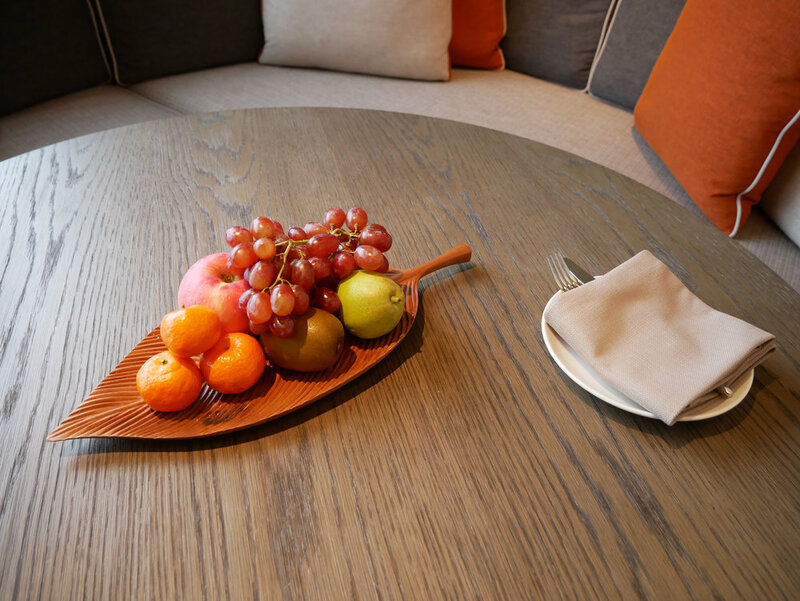 The guest room was thoughtfully designed both aesthetically and functionally, and the breakfast each day was outstanding. It’s not located in a convenient place for sightseeing, but if business takes you to the area, I’d jump at the chance to stay here.